Sen-Sen Ghost Sign, Broadway Theatre Center, 158 N. Broadway, Milwaukee, August 2012While in Milwaukee I couldn’t help but noticed all the “ghost signs” that have dissolved into the sides of the older brick buildings. 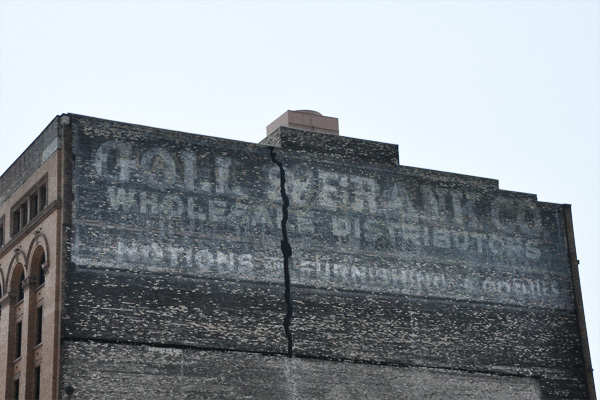 Ghost Signs can be found throughout the Midwest and all over America big and small. Ghost signs are large scale hand painted advertisements that remain on the sides of buildings, typically brick buildings. They are artifacts of modern industrial America and survivors of defunct companies. Drive In For Service Ghost Sign, Downtown Milwaukee, August 2012In Milwaukee’s Third Ward these advertisements are to be left untouched. Building owners cannot paint over them or restore them. According to Rosemary Lane’s article in the Milwaukee Mag, the guidelines state the signage must “age gracefully in their original form.” As they are, these aged signs do bring character and charm to older buildings and neighborhoods. The idea that not everything necessarily needs to be preserved is refreshing. These ghost signs are reminders of a time when we made things, something hard to find these days and rare in advertisement. Snirkles Ghost Sign, The Lofts on Broadway, 191 N. Broadway, Milwaukee, August 2012Ads of this size are typically done in vinyl because it’s more economical and faster to put up then a hand painted mural. Of course vinyl will never have the impact and craftsmanship of a “slow” ad. These ads took many hours to do, in various weather conditions and from various heights. Painting these ads became a tradition in some families, passed down from one generation to the next. In the film Up There we can catch a glimpse of what goes into painting modern mural ads. Mural painters work on small sections of an ad at a time from great heights. Even though these “slow” ads are still in practice, they are rare to find. They mostly exist in large cities like New York. Ghost signs however, can be found almost anywhere, big cites, small towns and even in rural areas on barns. Do you have any near you? Should they be restored? Or left to age?